We just returned from a 9 day 2300 mile whirlwind trip South. The main purpose of the trip was to visit my Dad's oldest sister and her family in Bossier City, LA. We only wanted to inflict ourselves on my relatives for a few days so we spent the rest of the time looking for interesting things to see. Starting on Saturday, March 29th we drove to Mammoth Cave in Kentucky. We stayed in Nashville then drove through and Memphis and on through Little Rock. On a whim we stopped at Hope, Arkansas. Hope is the birthplace of former President Clinton. 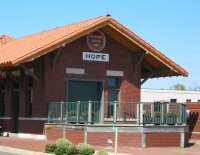 The old railroad depot in Hope has been beautifully restored and is now a combination visitor center, railroad museum, and Clinton shrine. Eventually we arrived at Bossier City. Bossier City is across the Red River from Shreveport, LA and is home to Barksdale AFB and several large casinos. Barksdale AFB is home to the Eight Air Force. B-52 and A-10 squadrons currently operate out of this base. My uncle Jerry gave us the guided tour of the base then we stopped at the 8th Air Force museum which is just inside the main gate. While small the museum is well done and has a large outdoor static display of aircraft. Next we visited the Touchstone Museum in Bossier City. This museum contains over 1000 stuffed animals and a wide variety of historical artifacts. It was an interesting and sometimes creepy place. Finally we visited my cousin Brian and his wife at their beautiful lakefront house. They showed us around, fed us, and in general showed us a wonderful time. After leaving Bossier City we drove to Vicksburg, Mississippi. 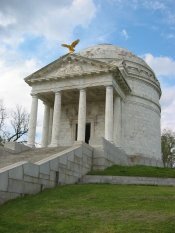 Our main goal was to visit the Vicksburg National Military Park (site of the Civil War Siege of Vicksburg). The park is huge with a road snaking along both Confederate and Union trenches for over 20 miles. Markers along the way show in great detail how the battle played out. More impressive were the monuments individual states erected in the park. These are not low-rent drop-a-surplus-cannon-in-the-park monuments. Vicksburg today is a pretty riverfront community with a lot of history behind it. From Vicksburg we drove through Alabama to Huntsville. On the way we stopped in Cullman to see the Ave Maria Grotto. A Benedictine monk named Joseph Zoettln spent his life decorating this area of the St. Bernard Abbey with handcrafted miniature buildings, shrines, and monuments. 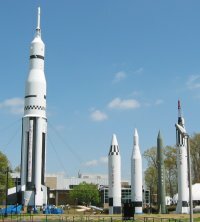 Finally we hit Huntsville and the US Space and Rocket Center. Nothing can prepare you for how large a Saturn V rocket actually is. It is a little depressing that we have not done any better in the last 30 years. Still the museum is very cool and the Space Camp and Aviation Challenge programs looked like a lot of fun.